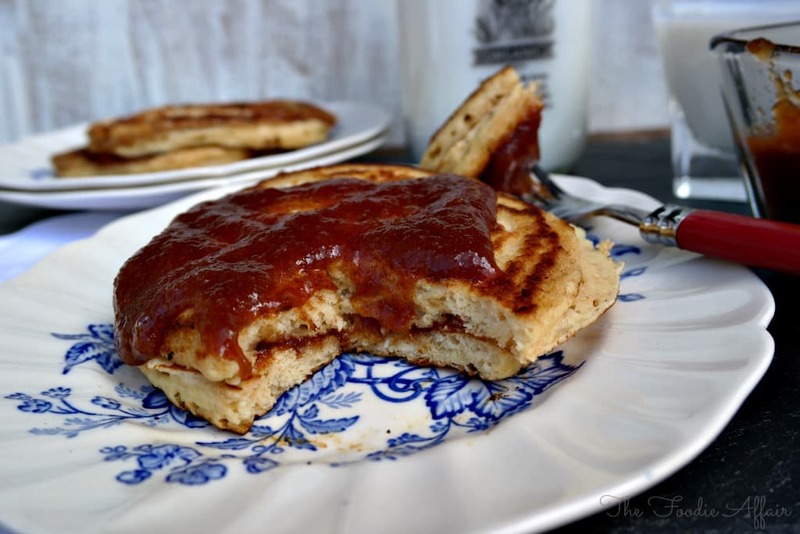 Start your morning with light and fluffy Cinnamon Apple Pancakes! 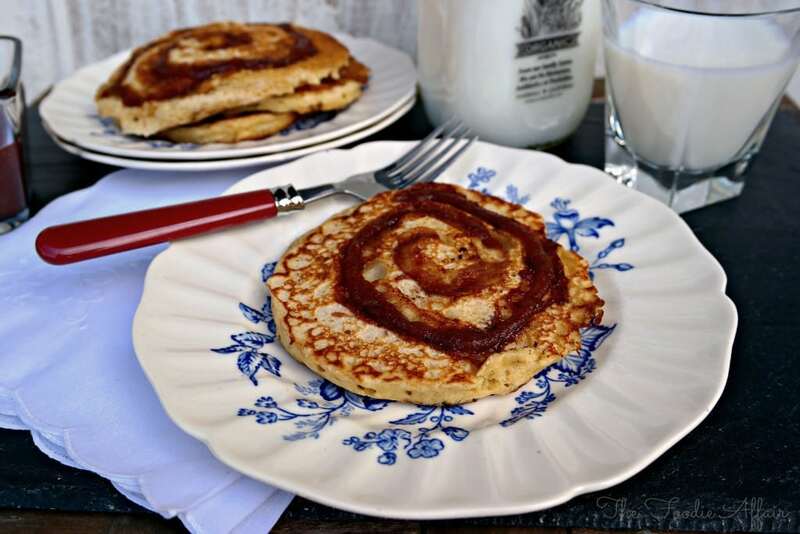 A swirl of the cinnamon apple sauce is cooked into the pancakes, and then added to the top like syrup. We don’t go out to breakfast often, but a few weeks ago, my hubby and I took the morning off from our jobs, and enjoyed breakfast in town! We live in a touristy area with several choices of good restaurants with lovely views of the ocean, but nestled in a strip mall in a nearby town is a restaurant called The Breakfast Club. It’s located on a busy street and parking is a premium, so taking several drives around the lot is not uncommon. Unless you know the restaurant exists, you would probably never know to stop in, so I guess it’s considered a hidden little gem for the locals. The atmosphere is comfortable, the servings are hearty, staff seem to know their regular customers by name, and they serve home-style cooking with several special dishes that have the cook’s personal touch. I picked a veggie omelet and my hubby chose the special; cinnamon pancakes with a side of eggs and bacon. Of course as soon as I saw his plate, I wished I picked that one! I love the smell of cinnamon! The waif of the spice was passed right in front of me, and what I thought would be a sprinkling of cinnamon was actually a swirl right into the batter! Then they added a topping that looked like the icing you get on a cinnamon bun! Yeah, pretty decadent. My omelet was scrumptious, but I thought the swirl in the pancake was such a fun idea; I had to recreate the recipe at home. I played around with the cinnamon filling using butter mixed with sugar and cinnamon, and that was pretty darn good, but the butter and sugar got super sticky requiring a clean up after each batch, and as the butter cooled, it began to clump up. Plus, it’s my nature to swap ingredients for healthier options. Unsweetened apple sauce with brown sugar and cinnamon was my swirl, and it quickly turned into my topping as well. 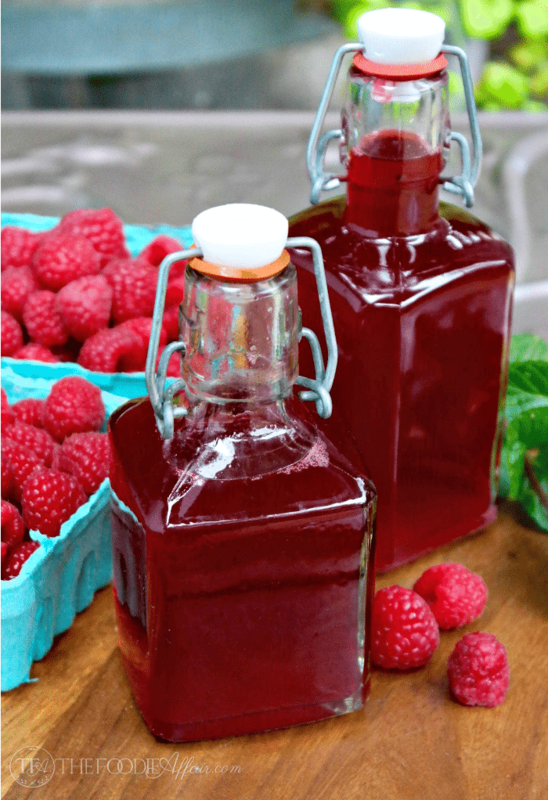 You can add maple syrup or even make an icing topping if you prefer. I put the remaining sauce on top of the pancake, and was tempted to eat the sauce by the spoonful. It was so yummy! Prepare sauce before making batter and set aside. 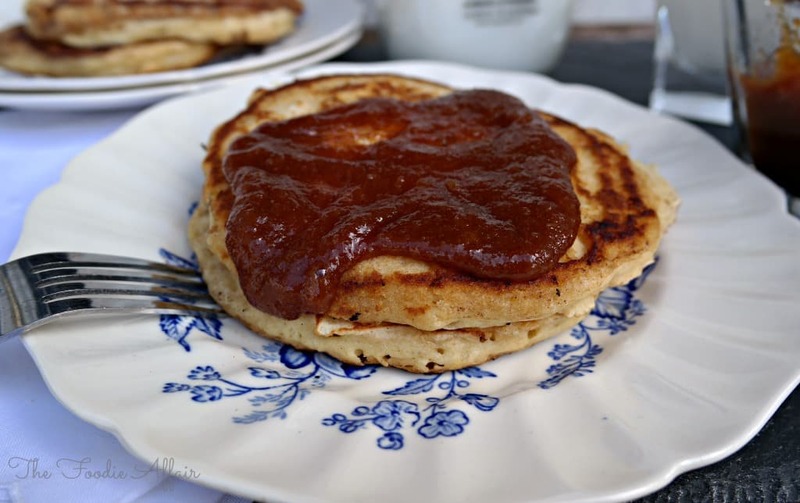 In a small sauce pan on medium heat warm apple sauce and brown sugar together, stirring until sugar has melted. Add cinnamon, mixing well. Let cool slightly while preparing batter. In a large bowl whisk together flours, baking powder, baking soda and salt. In a medium bowl combine milk, eggs, vanilla, melted cooled butter and vanilla extract. Add egg mixture to flour mixture to make batter. Place cinnamon-apple sauce in a piping bag or Ziploc bag cutting the corner. Spray grill or skillet with cooking spray or grease with butter on medium heat. Add 1/4 - 1/2 cup servings of batter to pan. 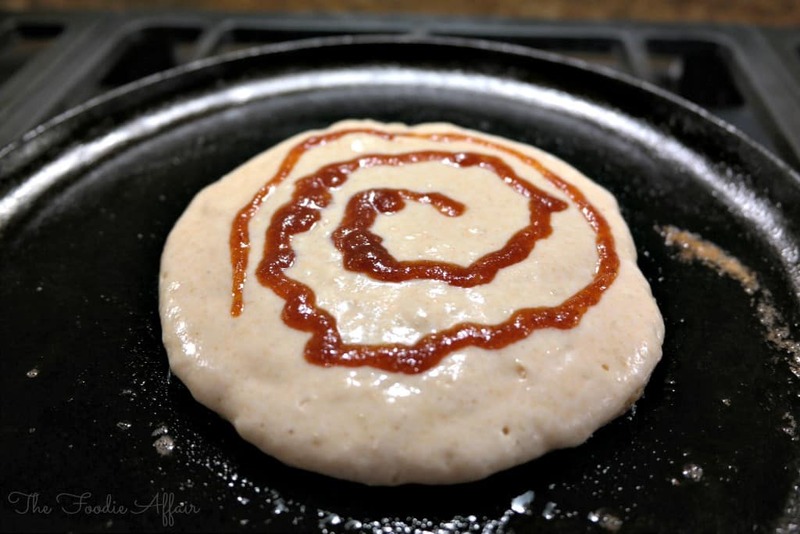 Add a swirl of the sauce starting from the center of the pancake to each pancake. Flip when bubbles form at the edges of the pancake. 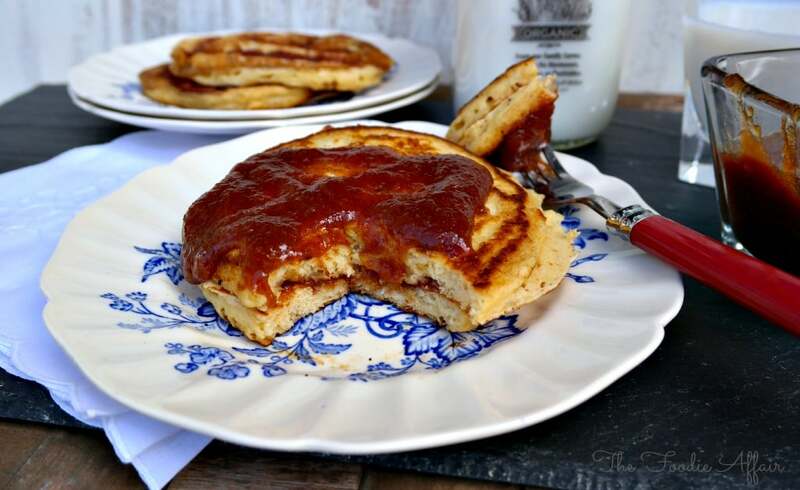 Serve pancakes with remaining sauce or top pancakes with your favorite maple syrup. You may need to double the sauce mixture if you intend to use it as the topping. I halved the pancake recipe and had plenty of sauce to top the pancakes, but making the whole recipe will yield less sauce for the topping. A very clever use of apple sauce. I would use it as my pancake topping as well. The apple cinnamon topping worked out really well! This is the best way to start your day! Happy food dance 🙂 that’s for sure! The cinnamon apple swirl sounds AMAZING. I have to admit, I’m usually the one with the envious plate. Not this time! Haha! These look delicious! That swirl of flavor is great. 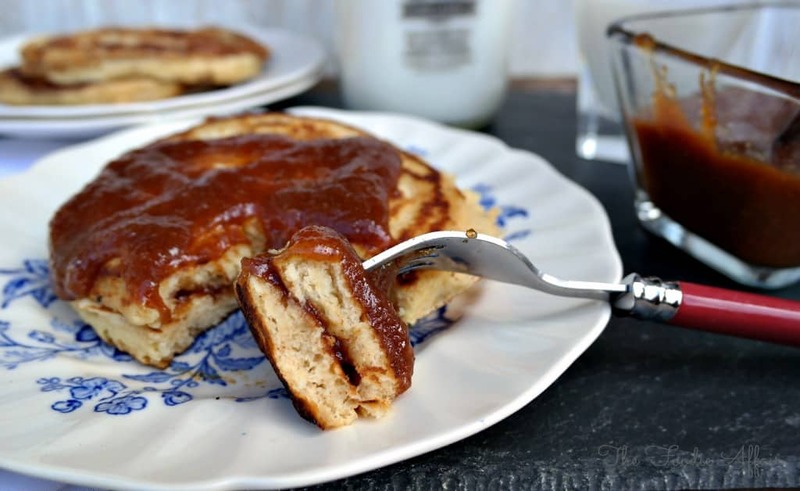 I’m a sucker for cinnamon buns and these pancakes looks so good. Pinned. Hi! What a great idea! Thanks for stopping by #TheWeekendSocial and linking up! I have pinned, stumbled and shared your link across social media. I hope to see you again next week!